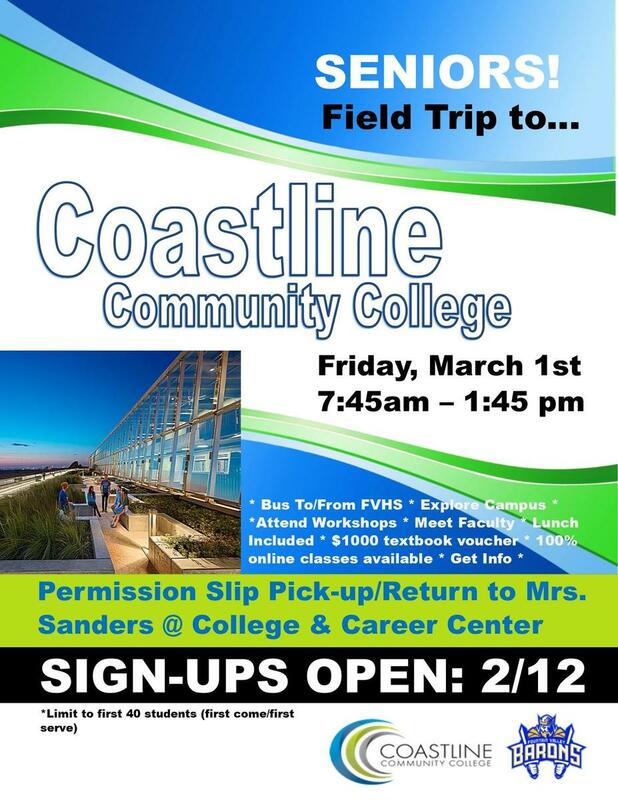 We're kicking off our field trip season to Coastline Community College (CCC) on Friday, March 1st. We will take a bus to/from FVHS to Coastline's Newport Beach campus. This FREE program consists of workshops with faculty and staff from various departments. Lunch included. Students MUST sign-up IN PERSON with Mrs. Sanders and submit a completed gold permission slip to secure their spot. Sign-ups start on Tuesday 2/21 and limited to the first 40 Seniors! The deadline to sign-up is Thursday February 21. 1. Do I need to go to Period 0, 6? Yes. For Period 0, your teacher may release you at 7:45am. 5. Can my friend or parent drive me back from Coastline? Students will be cleared for their absence only if they come back on the same FVHS bus. Students will otherwise be marked truant. 11. I don't have a 1st period, what time should we meet? Please meet in front of the admin building at 7:30 am, we will leave promptly at 8am. It's that time of year! 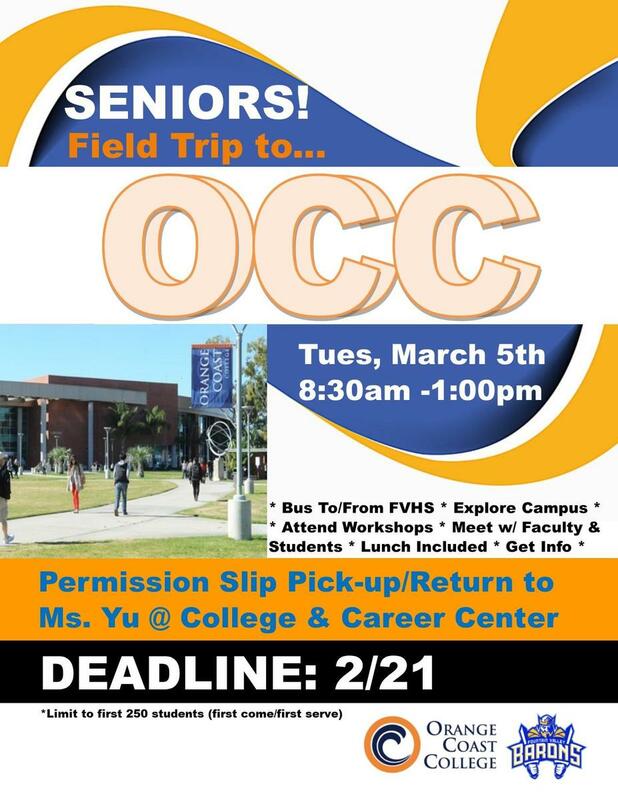 We're taking a FREE field trip to Orange Coast College (OCC) on Tuesday, March 5th. Students will get to meet current OCC Faculty and Students, attend workshops, and explore the campus..
Students MUST sign-up IN PERSON with Ms. Yu and submit a completed permission slip to secure their spot. The DEADLINE to attend this FREE event is on Thursday, February 21st and limited to the first 250 Seniors. Ms. Yu will be available for signups starting Thursday January 31st. 1. Do I need to go to Period 0, 1, 5, or 6? Yes. 4. Can I sign up the day of the field trip? It will be dependent on space availability, secure your spot now. This is a very popular field trip. 5. Can my friend or parent drive me back from OCC? Students will be cleared for their absence only if they come back on the same FVHS bus. Students will otherwise be marked truant. 6. Can I pick which bus to go in? Yes; however, students must sit in the same bus to and from OCC.